- 5 YEAR WARRANTY. Based on 3-5 hours' everyday use,Cloudy Bay Lighting offers a 5 year warranty.If for any reason you are not satisfied with your purchase, please contact us for an easy and fast replacement. - BEAUTIFUL WARM WHITE GLOW:Cloudy Bay designed the step light with 3000K cozy and warm LED to give off the right amount of light in the dark.Unlike other step lights which project the light straight out,this step light projects the light down so that it can illuminate each tread without glare. - SUIT YOUR HOME STYLE: Used on 120VAC. The sleek LED step light has a beautiful white finish face plate(2-7/8" height,4-3/4" width) which blends perfectly with the wall.Walking up or down the stairway you will never find it protrude too much from the wall. 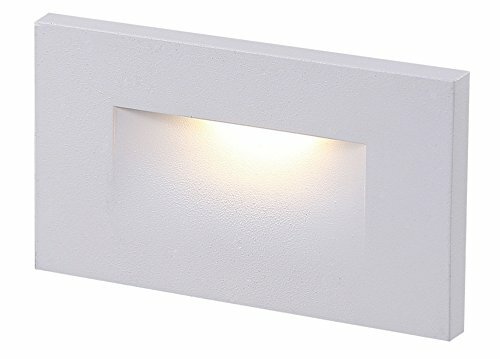 - LONG LASTING INDOOR/OUTDOOR LIGHTS:The wall mounted step light uses only 3W of energy and produces less heat.It can last for years to run.It also includes a rubber gasket to seal against moisture.The step lights have been tested by ETL to be used indoor or outdoor applicatons,such as stairway,pathway,driveway,patio or any other places where landscape lighting is required. - EASY INSTALLATION: Installs easily in standard gang box(screw holes 3-1/4" apart).For outdoor wet location usage,its suggested to use caulking to seal the upper 2/3 between the light fixture and the mounting surface after installation for the best water seal performance.